The visionaries behind the newest restaurant in St. Maarten are no strangers to the hospitality industry. 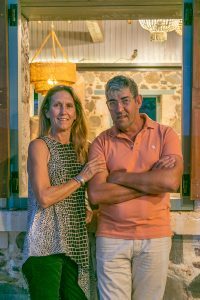 With over 20 Years of Hospitality Experience working together in restaurants Su and Norman Wathey have owned and operated in St. Maarten since 1997. Norman is a sixth generation St. Maartener and Su is a Bostonian who has made St. Maarten home for the past 34 years. Both are committed to providing a unique experience at Emilio’s. They are currently the owners and operators of Taloula Mango’s, a 180 seat restaurant situated on the Boardwalk in Philipsburg, servicing cruise passengers, stay over tourists and maintaining a loyal local client base. Su is also a 37 year veteran in the hospitality industry and has a vast knowledge of food and wine as well as keen sense of service. Norman Wathey brings a knack for attention to detail and financial management. He is a firm believer in presenting the beauty of St. Maarten to our visitors at a world class level. Su and Norman are also strong believe in the sense of community and public service. They participate in many charity organizations both giving freely of themselves and their time. They have proudly provided cultural sponsorships over the past years, including a young dancer from the National Institute of the Arts who attended an international competition in France; as well as a young student from the Youme’s Drum Corp who traveled to Howard University in Washington D.C for intensive training. Together, they bring proven experience, and local market knowledge of sourcing, staffing, and cost analysis to all of their enterprises. 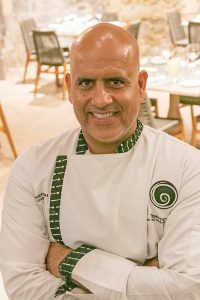 Chef Dino Jagtiani became the first St. Maarten-born son to graduate from the Culinary Institute of America in 1994. 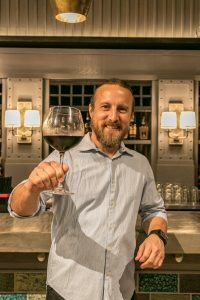 In 2002, after working at the 5 star Le Meridien, Waldorf in London, Chef Dino returned to, St. Maarten to open Temptation, which rocketed to the top of the island’s dynamic dining scene, winning “Best High End” by the local population in The Daily Herald readers poll 14 years in a row (and still counting). In February 2005, Bon Appetit magazine called Temptation “one of the top 10 new restaurants in the Caribbean.” In 2012 Food and Wine magazine recognized Temptation as one of the top 25 casino dining options in the world. Chef Dino is one of a small handful of Caribbean born chefs to ever cook at the famed James Beard House in NYC. He has also won many chef competitions including; 2 time gold medal winner at Taste of the Caribbean in Miami FL, and the San Pellegrino Cooking Cup of the Caribbean in April 2015. His restaurant has been featured in many international publications including National Geographic Traveller, USA Today, and American Way Magazine. Most recently in September of 2017, hurricanes Irma, and Maria cause massive destruction to many Caribbean islands, including St. Maarten, leaving Temptation Restaurant badly damaged. Chef Dino has since joined forces with local restaurateurs Norman, and Su Wathey to bring his creative, fine dining fare to the newly opened Emilio’s restaurant, located inside the Rainforest Adventure theme park. Chef Renata de Weever’s interest in the Hospitality Industry started at the very young age of 16, when she left the comfort of her hometown St. Maarten to pursue studies at Noorderport College Netherlands. There she graduated with a diploma in Hospitality Management, majoring in Hotel and Restaurant Entrepreneur Management. While obtaining this degree she began her hands on training at the Great Eastern Hotel in London as an intern. Renata quickly learned that continuing her education and professional development is essential to success in her chosen field. She then travelled to Miami where she earned both an associate and bachelor degree in culinary arts from Johnson and Wales University. Renata had the opportunity during her studies to complete two courses in Thailand and Singapore where she discovered different culinary techniques and Asian flavours. After graduation she completed a 2 and ½ years apprenticeship program at the 5 Star Mandarin Oriental Hotel Miami. Coming from a small island, Renata recognized that it is essential for her to obtain training in a fast-paced environment that executes service on a much larger scale than she would at home. In addition to her apprentice program she further developed her talent by shadowing her Mentor Chef Browne who owns Anaz Catering. This has provided her very valuable training on what it means to be an entrepreneur in this field. 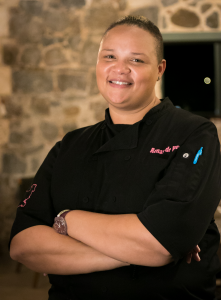 On returning to her hometown in st. Maarten she worked as a Sous Chef at the Sonesta Great Bay Resort and was the Captain of the St. Maarten Culinary Team in the 2017 Miami Taste of the Caribbean event. Currently Renata serves as a culinary instructor at the Nipa Culinary Institute where she shares her culinary skills and knowledge with students. Renata is excited about the accomplishments she attained this far in career and looks forward her continued success in the Culinary Field. Her motivation comes from the support of her two biggest fans her parents Sidney and Marie de Weever. Paul Peterson was born and raised on the friendly island of Sint Maarten. Throughout his 20 year career, he has had many opportunities to showcase his talent in the cocktail arena; competing and taking home the title of “Bartender of the Year” at Taste of the Caribbean in both 2006 and 2009. He was recognized by the prime minister of the Netherlands Antilles for his performance at “Taste of the Caribbean” and in 2013 was appointed by the governor of the island to personally care for the beverage service to the royal family of the Netherlands during their visit to the friendly island. In 2016 Paul was honored to be in the top 10 mixologists in the world for the Angostura global cocktail challenge of which over 900 entries from all over the globe competed. He has been a brand ambassador for Brugal and Angostura rums and works for various other companies in the wine and spirits industry. Paul is also a bartending instructor at the NIPA school in St Maarten where he shares his knowledge and passion of the service industry with the youth. He currently works at Emilio’s Restaurant where he is in charge of the front of house operations and the beverage program.